It’s been about nine years since Laney Griner took that viral snapshot of her 11-month-old son sitting on a beach with a furrowed brow and a fist-full of sand. The mom from Jacksonville, Florida, never imagined that the photo she shared with friends on Flickr would become a viral sensation. But it did. 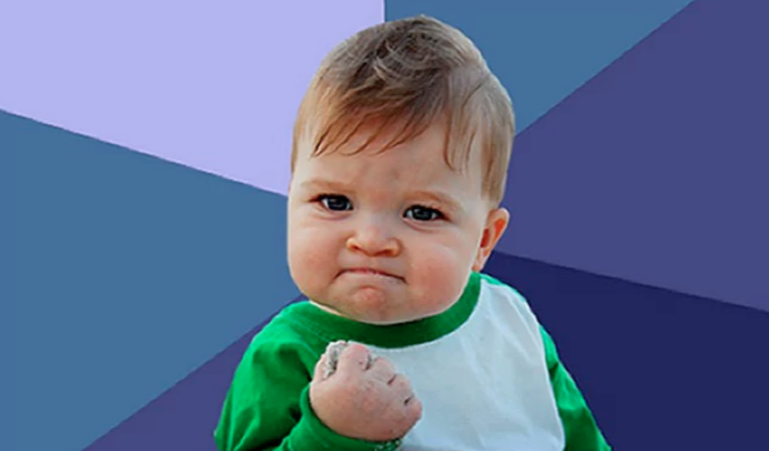 And years later, the boy in the picture, known by meme makers as “Success Kid,” is using his internet fame for good. The best part, Griner says, is that her now 10-year-old son, Sammy, really is a success story. He was born six weeks premature and had to get brain surgery as a preemie due to hydrocephalus, an abnormal build-up of fluid in the cavities deep within the brain. “He recovered fantastically, and he’s been great ever since,” Griner said. Last year, his dad, Justin, suffered a major health complication of his own — kidney disease. He started dialysis in 2009, but Griner knew that couldn’t continue forever. A loyal group of “Success Kid” followers happened to see Griner’s plea for help and chipped in to help the family in their time of need. Within days, more than $100,000 was raised to cover the man’s medical expenses. It’s now been a year since Justin received a successful transplant, and he’s felt better than he has in years, Griner said. As for Sammy, even though the picture kind of annoys him as people constantly ask him to mimic the viral pose, he’s thankful that it happened to go viral. That meme may just be the reason his dad is alive today.